Intaki brothers and sisters, as we encounter the citizens, capsuleers, and clone soldiers of New Eden during the course of our daily lives, let us honor our ancestors by putting to good use the ancient language of the Intaki homeworld. As you traverse the spacelanes and planets of New Eden, greet others with words of the traditional Intaki language used for centuries on Intaki Prime, birthplace of the Intaki people. Sprinkle your conversations with Intaki terms, and never fail to educate those you meet on their meaning. There can be no excuse for not at least uttering the ancient Intaki greeting of “Namas” from time to time. Click the cover to read the full text of the Vaanin! Click the cover image at right for the full text of Vaanin k’Intaki, or Speech of the Intaki. This monumental work, compiled by Citizen Sanjorel Epsulahm Artabanus of the Cognitive Sciences Research Initiative, along with the help of many others, is a definitive guide to the Intaki language, in detail. For the last word on proper grammar, vocabulary, and usage of the Modern Classic Intaki Language, look no further. These pages represent the premier abstract of the sacred words of the Idama, translated into the common language of New Eden. This text is a boon for scholars of any race and, in particular, for anyone of Intaki descent who wants to delve deeply into their Intaki linguistic heritage. If interest in the Intaki language is cursory, consider examining the Intaki lexicon below. It defines a few common Intaki words and phrases that most anyone should find useful to know. Links to resource files for the Vaanin k’Intaki appear below the lexicon. These include fonts, glyphs, dictionaries, glossaries, and image files. Keep the flame of Intaki culture burning bright! Preserve the language of the ancestors as a living tribute to the triumphs and sacrifices of those who came before. The following resource files are available for download. For an in-depth discussion of each resource, please see the Resources section at the end of the Vaanin k’Intaki. Before opening the dictionary or glossary files, it is advisable to first install the fonts that accompany the Vaanin k’Intaki, which are listed below. 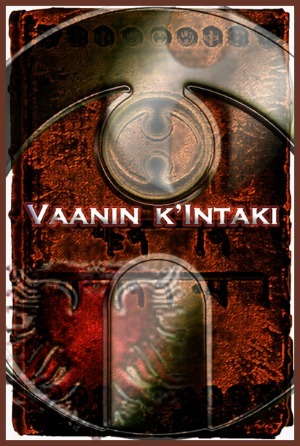 There are five Modern Classic Intaki Bhrasvalaank fonts used within this second digital edition of the Vaanin k’Intaki. This full set of Modern Classic Intaki glyphs will be useful for those wishing to create their own Modern Classic Intaki-based fonts. The glyphs represent all the letters in the language’s alphabet, as well as the language’s numbers, and a few additional symbols. The Vaanin k’Intaki contains a number of images which are useful for reference purposes. Placid Reborn website. Detailed list of expressions on which much of this lexicon is based. Intaki Liberation Front forum. Source of many of the Intaki military terms.